The lab created diamond market seems to be having the rug pulled out from under them. If you purchased a lab created diamond just one year ago, you would see the same diamond on sale for a fraction of the price you paid then. You’ll get better value for your money buying a natural diamond from Blue Nile or James Allen. It seems like that trend is continuing. Since DeBeers entered the market for synthetic diamonds, the price has completely fallen out from under them. Lab created diamonds (which have also been referred to as lab grown diamonds, synthetic diamonds, artificial diamonds, cultivated diamonds or cultured diamonds) are man-made diamonds that will mirror a real, natural diamond. Because they actually consist of carbon atoms structures, lab created diamonds will display the same chemical and optical characteristics of a natural diamond crystal produced by the geological processes of Mother Nature. While we think diamonds are beautiful and a great choice when you are looking to make a high-end jewelry purchase, we do not buy into the marketing that De Beers has rammed down our throats for a century, convincing people that you must buy a diamond when you get engaged. The founder of this site even wrote an article for Huffington Post to that effect. Our goal is not to convince people that they should buy a diamond. We are here to help people who are buying diamonds to get the best bang for their buck. We find the right balance of quality to get the biggest diamond you can within your budget and help you avoid any rocks or shoals along the way. Let’s get one thing out of the way: I agree that synthetic diamonds look exactly like natural diamonds (so long as we are referring to lab created diamonds, not diamond simulants or cubic zirconia). I’m not going to get into the technical details of how they make diamonds because that is not the issue. Take a look at this diamond ring. What do you think of it? Does it look like a diamond? Yes it does, because it is one. This article focuses strictly on the questions of value of lab created diamonds. If you’re interested in the ethical issues related to diamond buying, see this comprehensive article. Are Lab Created Diamonds a Better Value? This is the million dollar question that is not so easy to answer. In short, they are cheaper but they are worse bang for your buck. As we explain in this article, you shouldn’t view your diamond as an investment. On the other hand, you shouldn’t ignore the value entirely. Let’s say an average natural diamond retains roughly 50% of its value after purchase. Eventually the value of the diamond will rise (historically, diamond prices rise consistently), so if you ever try to sell it, you should be getting at least half (or possibly much more) of the original purchase price. Lab-created synthetic diamonds have no resale value. No jeweler will buy them back and if you try to sell them on eBay, you’ll get pennies on the dollar for it. So, from a value perspective, you would need to buy the lab-created diamond at a massive discount to justify giving up the value retention of natural diamonds. We are always working on our articles and making sure that the information and advice is up to date. It doesn’t help our readers when our assessments are off because of vagaries in the market, or changes in business practices. This article was the fasted edit I’ve had to make, by far. The changes in the lab created market this year (2017/2018) have been stunning, and alarming. Less than one year ago, we compared diamonds from the major online retailers of lab created diamonds, Diamond Foundry, MiaDonna, and Brilliant Earth to natural diamonds sold on Blue Nile. We have used Blue Nile as our baseline for this article as they are the largest, most reputable, online retailer out there. If you want to skip the details below, here is an example of two diamonds we compared. One is a GIA certified diamond from Blue Nile, the other an IGI certified diamond from Brilliant Earth. As we explain in our IGI article, they are a much more “generous” laboratory, so we adjusted the grades accordingly. 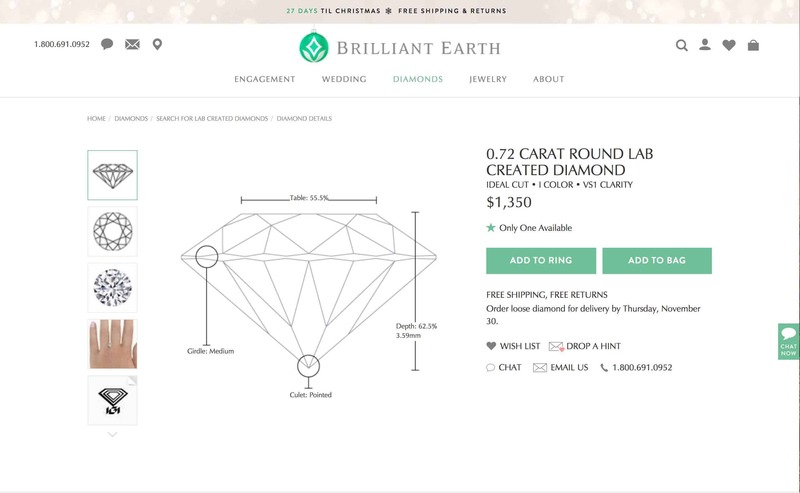 Brilliant Earth offered a 0.70 I VS1 IGI certified round diamond for $1,870. Blue Nile had a 0.70 J VS2 GIA certified round diamond for $1,499. You should take a look at both diamonds to see the quality for yourself. Just one year later, the difference is staggering. At the beginning of 2017 you can see from the example above (we did 10 such comparisons at the time and this one was about average) that lab created diamonds were actually higher priced than natural diamond counterparts. At the end of 2017 we have a very different landscape. Prices have dropped precipitously for man made diamonds while prices for natural diamonds have increased slightly. The change is dramatic. The natural diamond performed as expected. Diamond prices have historically risen at a steady rate. This is why you shouldn’t completely discount the “investment value” of a diamond. As expected as the natural price was, the price for the lab created diamond was alarming. In just one year, the price dropped 30%. The worst part about it is that there is no reason for the prices not to drop even further. How would it make you feel purchasing something special, which you felt had value, and seeing it in a store for a fraction of the price you paid? This is not a one off comparison. We analyzed many diamonds and the trend is the same. For example, a one carat I VS diamond cost $4,100 last year and now is down to $2,850 (a 35% drop). We even saw a fascinating phenomenon that highlighted the alarming nature of the price change. When looking at diamonds on Diamond Foundry (made famous by their movie star investor), we noticed that the price of larger diamonds dropped at a faster rate in comparison to others. This shows that the major roadblock in pricing is merely the manufacturing (which will continue to fall), and that there is no inherent value in the product. In all, the price for lab-created diamonds have halved in the last two years according a report published by Bain & Company. The market for lab created diamonds is eerily similar to what happened when lab created emeralds burst on the scene in the early 90s. At the time, emeralds were (and still are) one of the rarest precious gems on the market. Innovations in technology allowed manufacturers to replicate a natural emerald and create a virtual copy. I recently had the chance to sit down with a former CEO of one of the largest lab created emerald wholesalers (the CEO wishes to remain unnamed). People were excited and started to jump on the bandwagon. Lab created emeralds started popping up in jewelry pieces in reputable jewelers all across the United States. But it did not stop there. “As with any technology, as the demand increases the competition floods in. The prices for lab created emeralds plummeted below any level we could have imagined. One day we were selling lab created emeralds for hundreds of dollars a carat. The next day the price was in the $40 per carat range” recalls the former CEO. Soon thereafter, people were buying “emerald” jewelry in Service Merchandise (and old school catalog discount retailer similar to Sears) for $79 or $99. They were popular for about a year or two, then faded away. You can still buy them, but they are about as far from popular as can be. Is it fair to compare lab created diamonds to emeralds? Yes and no. From a technical standpoint, it’s hard to imagine that the price of lab created diamonds won’t continue to plummet. There is no cap on supply and economies of scale (along with innovation) will continue to force the price down. Will they fade away in popularity? That’s a trickier question. Emeralds are beautiful, no doubt about it. But the diamond market has positioned itself as a must have purchase when getting engaged (hats off to DeBeers for incredible marketing the last 80 years). If I had to bust out my magic 8 ball, I’d say that lab created diamonds will thrive in the market for engagement rings under $1,000. As with the emerald market, no one that is investing a hefty sum of money will be interested in a lab created diamond. But when the option is a terrible looking, incredibly low quality diamond from Zales or a lab created diamond that looks beautiful, many people will opt for the lab created diamond. Well what about someone in the market for an engagement ring today? Technically, you can save some money by going with a diamond ring like this in comparison to a natural diamond. But it seems like you would be throwing money in the toilet. Why spend a few thousand dollars for something that most likely will be selling in stores for a fraction of the price in the near future? There is no way you will end up feeling good about that purchase. There can be other reasons for going with a lab created diamond (I have had readers contact me that were engineers and were in love with the fact that it was created instead of natural), but you should recognize that lab-created diamonds seem to be a terrible value bet. We are not telling you that you should buy into De Beers marketing BS. You certainly shouldn’t feel compelled to buy a diamond. But if you are, I would recommend a natural diamond over a lab created one. I would not be keen on investing such a hefty sum of money on a product if it is likely I will be seeing the identical product being sold for a fraction of what I paid for it in the near future.